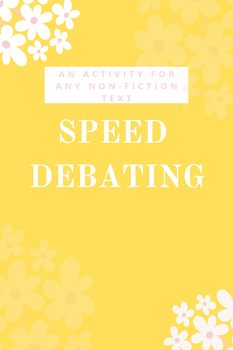 My students love when we speed debate! This is a fun and challenging way to get all students engaged in argumentative writing and speaking, while also developing their ability to find and use well-chosen evidence to support a claim. Students are given two academic articles, each on the opposite side of an argument. I often do the first speed debate over DNA cloning. Students get two articles that walk through the extinction of the Northern White Rhino and the two arguments for whether or not scientists should use DNA to create new rhinos. Then, they must plan an argument for both sides of the argument. I also love to pair this activity with Achieve3000 articles. After reading, the real fun begins. Students pair up and each person gets one minute to state their claim and evidence as persuasively as possible. While their partner is speaking, the other student is taking notes on the argument. Once both students have gone, they get one minute of silence to plan their rebuttal. Then, I give each student 30-45 seconds to share their rebuttal. We rotate through this process three or four times, then have "debate-offs" if time allows. Students who wish to debate or who are voted on come to the front and debate to the whole class and a winner is chosen. Overall, it is an awesome activity and can be used throughout the school year as a "break" for the students, who don't realize they are still engaging in learning and practice.